I've driven by here so many times and never had chance to go in. But I'm very glad I did. What a magnificent place. Tiny (seats 16 at most) but perfect. The ebcb is tiny too. But not stingey small. More like a perfectly miniaturised ebcb - as though it was a piece of Japanese electronics. They've just crammed all the joy and detail of a bigger fry-up into this smaller, more convenient package. Look at the way almost every component is dangling over the edge of the plate. Brilliant. And delicious. That's almost all of it right there. It's curved because of the railway arch. Got a big cycling poster. Behind the counter is the kitchen, if that's the right word. 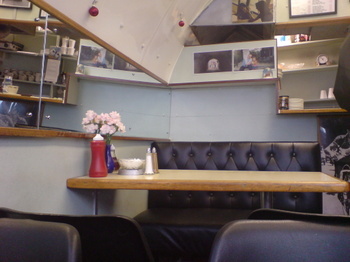 And the menus are there on the wall, no room, or need, for extra menus on the tables. 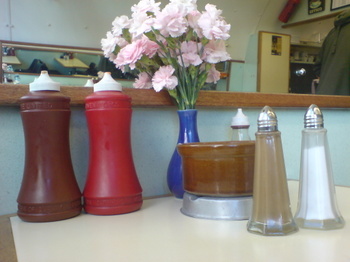 Despite the smallness of place look at the generosity of the condiments. And a bunch of flowers too. Splendid. Fantastic crockery. This whole place has a slight worm-hole to the Festival Of Britain sense. And it might be small but that doesn't mean it's not luxurious. You could settle back and relax in that padding. And look in the mirror, worry about how fat you're looking and order some more chips. Nice to see some Christmas decorations still up. That's the festive/festival spirit. This is a brilliant place. Must go again. It's right by London Bridge so if you're passing by, pop in. Can I just say, I love to visit your blog! I live in the American southwest, where we don't do the EBCB combination, but I love to look at your blog and dream, yanno? Right, that's it. I've passed this place so many times and have wanted to stop in equally many times. Next time I'm going in. Thanks for reminding me. great website, I've just been shown it by a friend. I'll definatly pop back for another look. 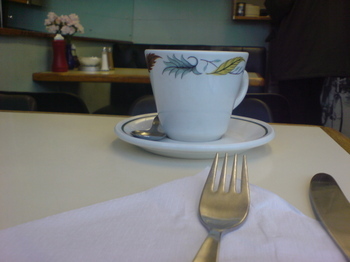 You have been to a couple of cafe's near to my work too, which is quite nice. 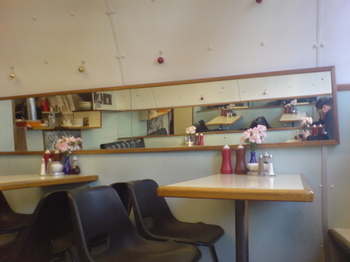 Can I suggest a visit to the Nile Street Cafe, Nile Street N1. Just round the corner from the Sheperdess Cafe on City Road. i think this is the quirkiest one so far. Hey, Just wanted to say I really like your blog. What a fantastic way to use webspace. I really like the pictures, especially the condiments. Great writing style. I wish you many more happy breakfasts. I just wanted to say I love this blog ! Thanks for sharing your pictures and experiences ! 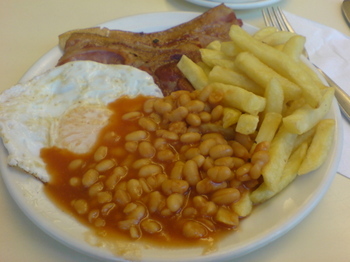 Love bacons, chips, and even beans...but I can't stand fried eggs! 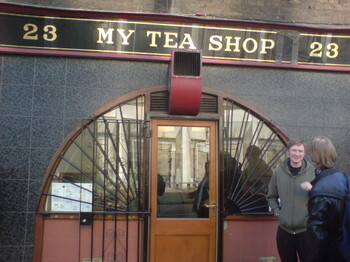 Hi, have been in 'My Tea Shop' several times when I used to work in London Bridge. 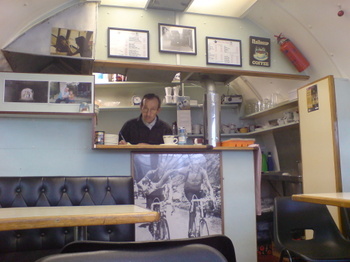 You refer to a cycling poster in the cafe and as I recall there are also a few other cycling photos on the wall. I might be wrong about this, but I'm sure the guy who runs the place, is featured in some of the cycling pictures/posters, albeit a more youthful, fitter version. Thank you for the website and for bringing back many happy childhood memories.